The seed for Smart As Poop was sowed years ago when we moved our young family to a rural property in Stittsville (Ottawa), Ontario. We had two young children at the time, the elsdest was two, and was filled with wonder for the mysteries, big and small, of her new surroundings. We chose to foster and fuel this curiosity by creating a home environment that immersed our two rapidly developing minds in an environment that inspired and encouraged questions. My partner and I turned to nature in our quest to immerse our growing family in learning experiences at home. First, with the help of the Rideau Valley Conservation Authority, we reforested our 28 acre rural Stittsville (Ottawa) property with over 15,000 saplings. Second, we started a vegetable garden and began to raise chickens for fresh eggs and meat. It was important to us that our kids grow up knowing where food comes from and to have a healthy respect for the work that goes into putting food on the table. However, despite having fertilized our garden soil heavily with local composted sheep manure, we were terribly disappointed with our first year's gardening experience and the resulting harvest. The solution (and Step 3) ... vermicomposting! Vermicomposting was a huge hit, the kids took to it instantly and the harvest from our garden has been truly impressive ever since! We are not perfect parents,nobody is, however I do believe that we have succeeded in our quest to encourage and foster our two little inquisitive minds. Young children are naturally curious and inquisitive, to squash their thirst and enthusiasm for knowledge would have been tragic. Food for Thought: feed the worms ... grow the mind. My kids' uncanny ability to "hit the nail on the head" often leaves me speechless, impressed, proud, humbled, and yes, sometimes even embarrassed. They have both on separate occasions offered the following unsolicited observations: "Mme X is a good teacher because she makes learning a game." and "I like Ms. X because she makes learning fun." No matter the age, stage or grade level of students, an inquiry based learning approach is most effective. Allow students to explore and learn in ways that come naturally to them ... through exploration and inquiry. Better yet, create a learning environment that is saturated with "educational white noise" so that they are learning without realizing that they are being taught. If you can add the element of fun, well, that is just icing on the cake! Ask not what you can do for your vermicomposter, but what your vermicomposter can do for you! In my experience, vermicomposting with the use of red wigglers is a creative, innovative, fun and educational tool for the classroom. It engages students, provides immediate reinforcement and is relatable and relevant to a student's everyday life. An in-class vermicomposter can provide an inexpensive, accessible, living, breathing, growing, ever changing and evolving ecosystem from which students can observe, manipulate and learn. It supports many aspects of the Ontario Curriculum, not just the Science and Technology component. I was a teenager when I first heard about people composting indoors using worms (red wigglers), and, to be perfectly honest, my reaction was "ew ... gross"! Fast forward many years and two kids later, and boy have my feelings changed! Though red wigglers have no teeth, I can personally attest to the fact that they do have "bite", and once "bitten" by the red wiggler you can not help but be amazed by its performance. Did you know that a red wiggler eats half of it's own body weight in food scraps per day! One will most certainly be amazed by its power and potential to have a real, meaningful and lasting impact on the hands that shape the world. To introduce teachers and students alike to an educational and environmental super star (red wiggler composting worms). To take the "ew" out of vermicomposting. 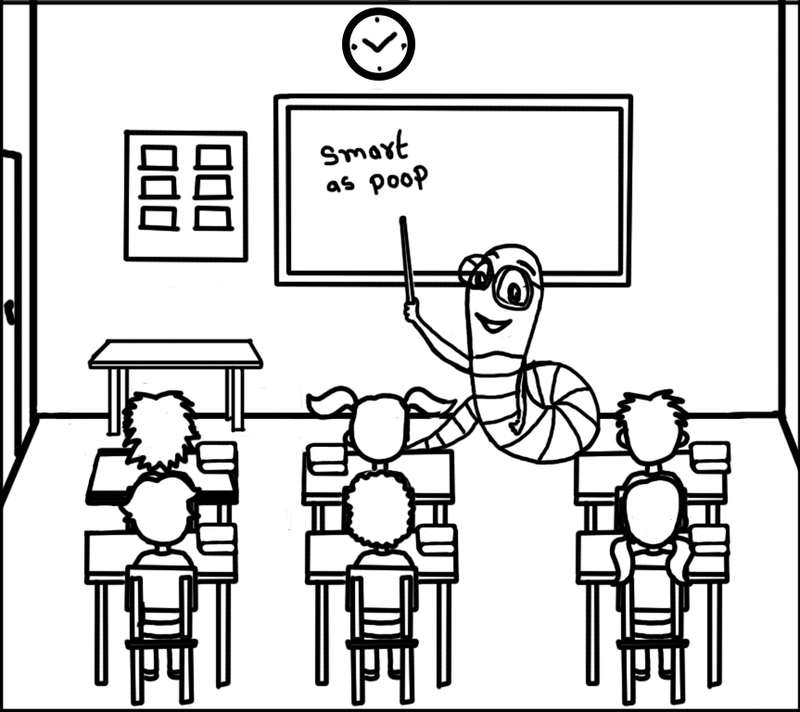 Smart As Poop invites and challenges teachers to host and in-class vermicomposter. Harness the power of the red wiggler, a creature whose potential environmental impact is matched only by its potential to inspire and feed young minds. Help your students realize why the red wiggler is an environmental super star and that the red wiggler, in the right hands, big or small, can become part of tomorrow's waste management solution.